A few years ago I read a study of the longest living people in the world. The elders didn’t just live a long time, they were healthy, bright and enjoying life! This study changed my life. It changed my eating habits, the way I viewed exercise as well as time spent relaxing. I lost all excess weight and have much more energy. While I may not follow everything exactly every day, the principles remain with me years later. 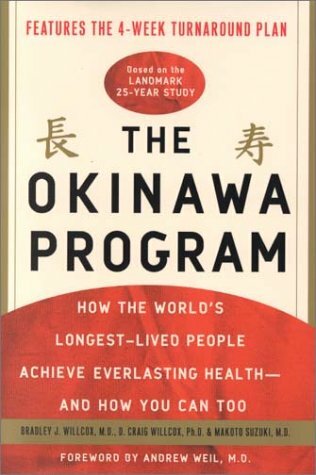 The book was called “The Okinawa Program” by Makoto Suzuki MD PhD, Bradley Willcox MD, MS and Dr. Craig Willcox, Ph.D.